5 weeks of literary analysis lesson plans for Epic of Gilgamesh. Includes pacing guide, pre-reading, film essay, activities, reading quizzes, notes, posters, character analysis and discussions. 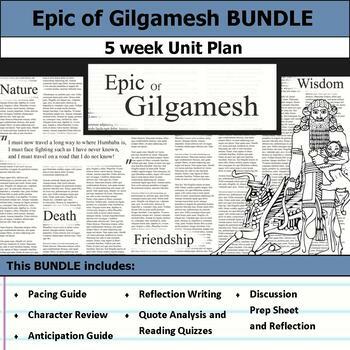 This unit plan contains everything you need to add relevance and rigor to Epic of Gilgamesh in an engaging way! This bundle of resources supports an in-depth analysis of the text. Students will be encouraged to think deeply and write about themes and character development with these activities. There are eight resources developed explicitly for this text, and two additional resources that can be used with any text to round out the unit bundle.